Have you downloaded the Instagram application and opened an Instagram account but never used it? 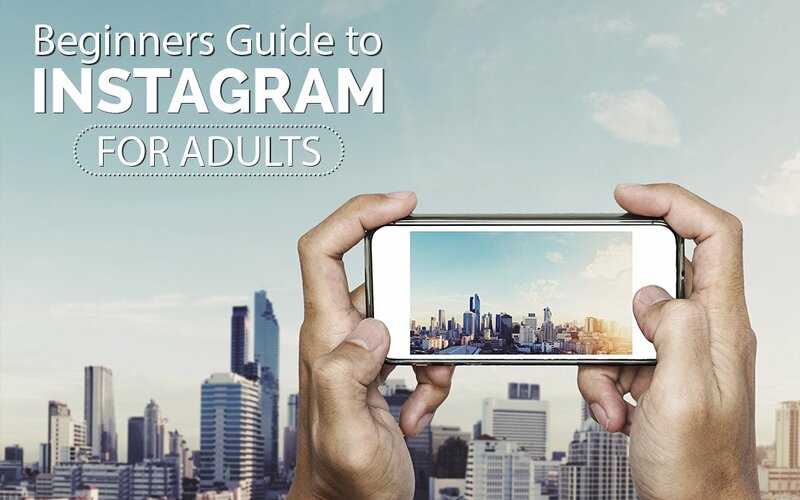 Many adults are baffled by Instagram and how it all works. They ask questions like: how do I use this app? What are these hashtags and how do I find them? Why do my photos never get liked? Mostly I hear, I downloaded it, but I just don’t know how to use it. In this post, I will try to simplify the application with this Beginners Guide to Instagram. Let’s start with the very basics. 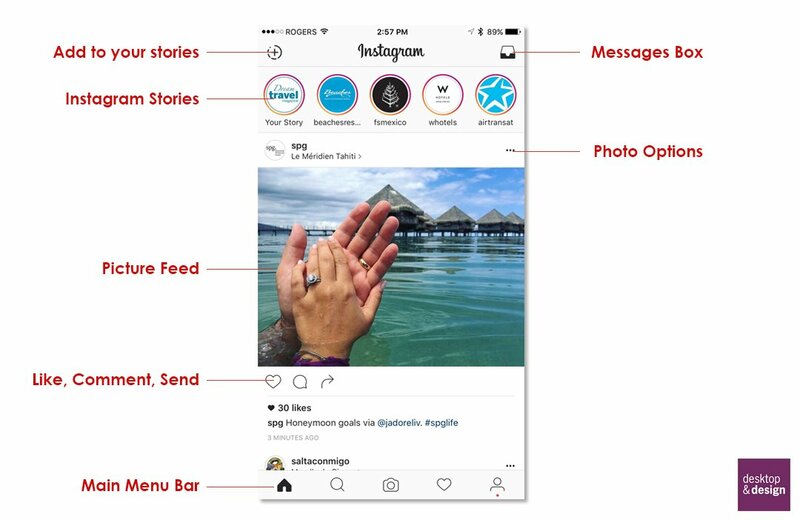 The Instagram app is now home to photo and video uploads and the new Instagram stories. Upon opening the app, you get a screen that looks a bit like this. The Main Menu Bar: is located at the very bottom of the screen. Here you can navigate between the main windows in the application. Home, Search, Photo Upload, Likes/following and your user profile page. Like and Comment: This is the page you can like or comment on photos that appear on your feed. This feed is made up of photos from people you follow on Instagram. The search page (above) appears when you click on the small magnifying glass on the main menu bar. 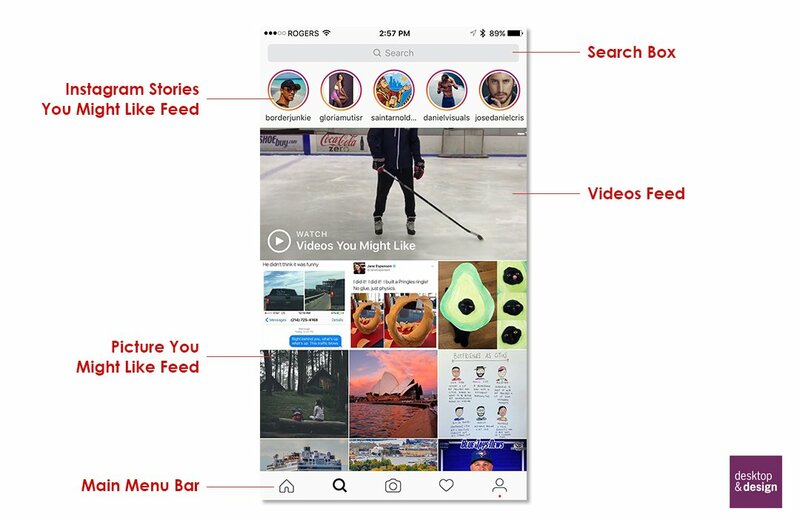 Instagram will show you photos you may be interested in, or you can click on the search field at the top and find accounts you would like to follow. On this page, you can search for other users to follow or hashtags to use when posting pictures. Just enter the keywords in the search box and it will show you a selection of users and hashtags that match. Before we start uploading photos into Instagram lets, take a look at your profile page. Here you can adjust your profile and connect your social media accounts to Instagram. If you want to share photos with your Facebook profile or pages, you will have to set them up here. Click on the settings button to access these features. It is a good idea to get this page set up before you start posting photos, especially if you would like to link your Instagram photos to your personal Facebook profile or professional Facebook page. When clicking on the small camera icon located in the middle of the menu bar you will reach the photo selection page (above). You may have to give Instagram permission to access your photos first (a pop up will appear asking you to approve). At the bottom, the main menu bar switches to allow you access to your phone’s camera library, photo camera or video camera options. It is not recommended you take photos within Instagram. 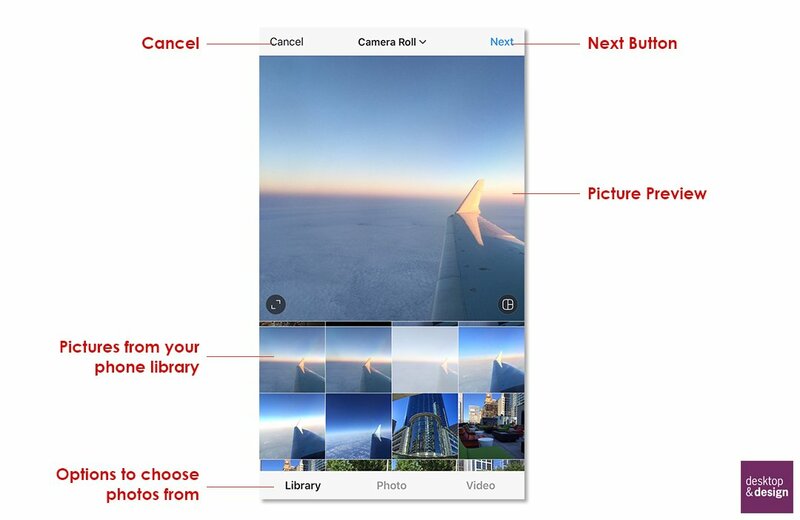 Use your phone’s camera app to take photos and then go into Instagram to choose the photo from the library. Once you select a photo it will show up in the large preview window. Click the Next button to proceed to the Edit photo options. 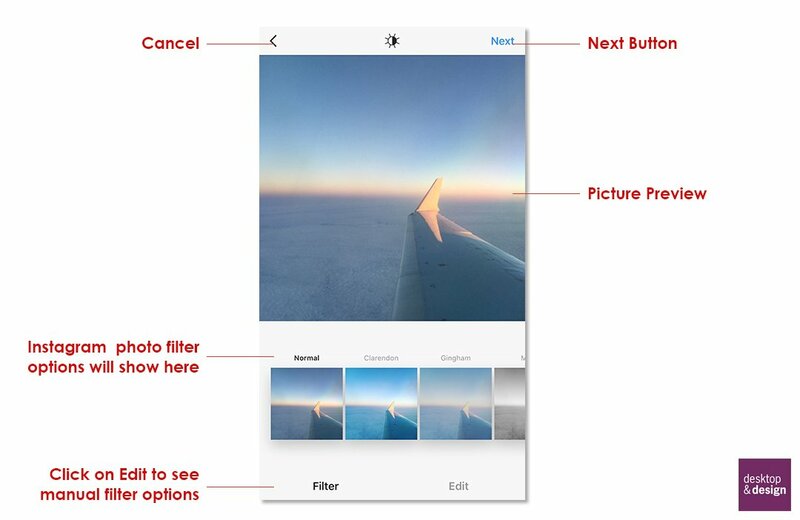 Your first choices for editing photos are to use the filters that come with the application. These filters are often used by beginners and are not your best option, however, you can scroll through them by swiping to the left and right and preview how your picture is going to look before you hit next. Notice the faded out Edit button on the bottom right of the screen? Notice the small sun at the top of the screen? These are buttons that lead you to manual photo editing features in the application. Let’s look at the manual approach to editing your photos that will make them look their best and boost Instagram engagement. 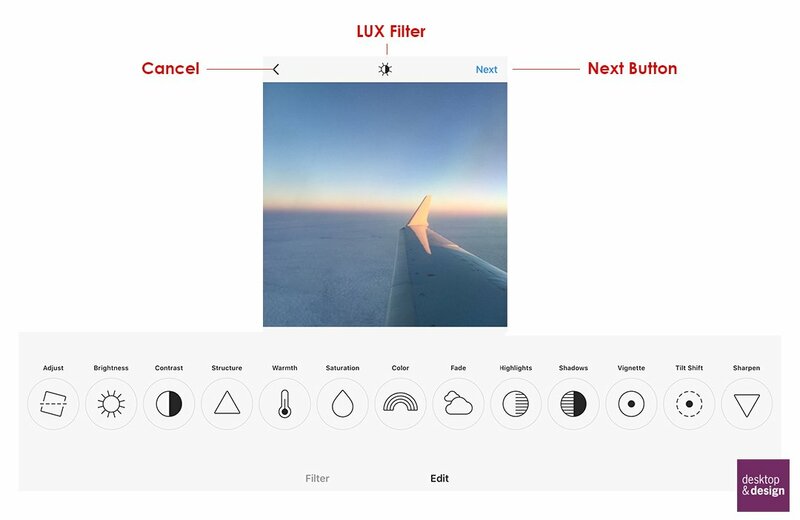 The LUX filter at the top of the screen is one of my favourites, start here. After touching the lux button, a small slider will appear, move the slider to between 5 and 15 percent to give your photo a little sharpness and depth. Lux: It automatically jumps to 50 on the slider, bring it down to between 5-15. Brightness: Adjust how dark your photo is. You won’t always have to use it, but if there is too much sun you can bring it down by lowering brightness and alternatively if you are in shadows you can brighten the photo up. Structure: A little bit goes a long way, but this will bring your photo to life by doing a bit of sharpening. Warmth: Boost the warm colours by moving the slider to the right and for cool colours like blues move the slider to the left. Saturation: Again just a little drop will help the colours in your photo pop off the screen. One little trick, if you touch on the photo preview while editing you will see what it looked like previously. Once you are happy with your adjustments you can hit the next button. 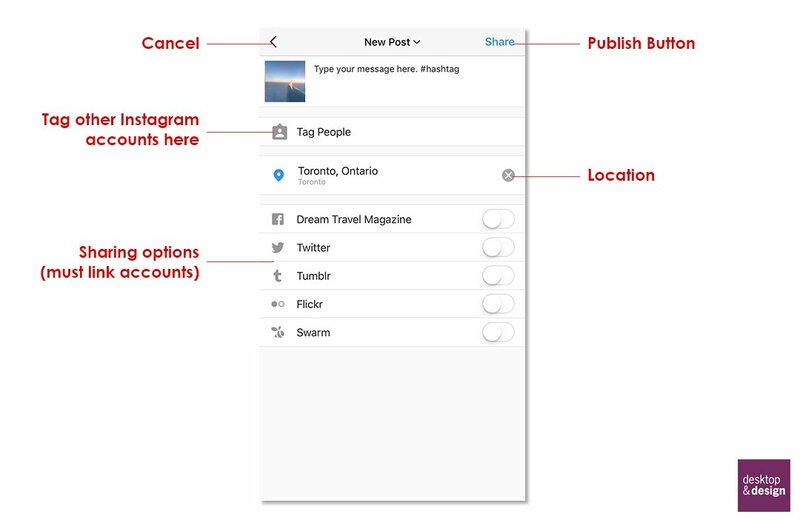 Before you hit the share button type a brief message in the text field next to the image and include hashtags if you like. You can edit this after publishing if you like. Normally I include a short message about the photo and 1 or 2 hashtags. I’ll discuss hashtags more below. Also be sure to add a location to your post so people can find your photo using the search screen. If you are taking a photo of another Instagram user or want to share the photo with someone that will find it interesting you can tag them using the “Tag People” feature. There are a few things that rookie Instagrammers do that you can avoid. The most important advice I can give you is do not mix personal and business intentions in Instagram. If you are running a personal account, then share photos of your pets, kids, etc. However, if you your intentions are business, and you are a writer, photographer or business owner then keep it professional. Do not use collage picture tools to create collages of multiple photos. Focus on one photo at a time. Do not publish numerous photos in succession. Save your photos and post 1-2 times a day. If you are promoting an event, you may push this number up, but if your photos are hogging the Instagram feed, some users will unfollow you. 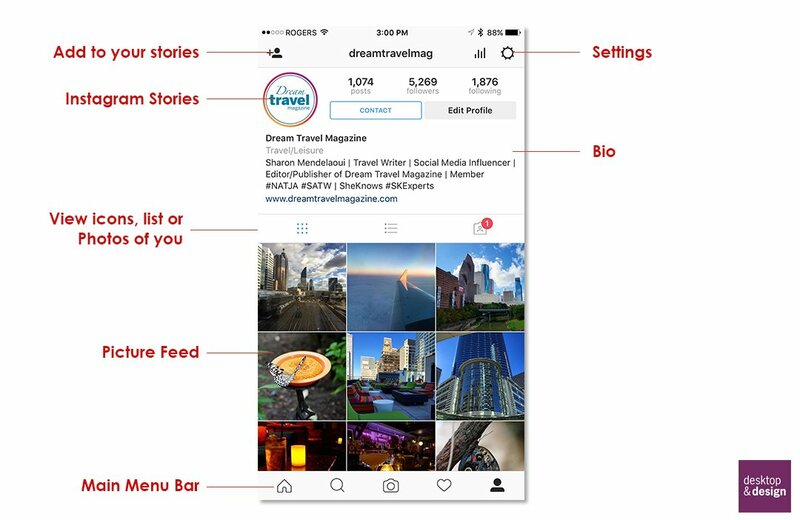 If you are trying to build a following and engagement, be consistent about publishing photos: keep an album on your phone where you can pull new photos for your feed. Make sure the pictures are relevant to you and/or your business. A good rule is one photo a day. Vary the pictures you are posting, don’t duplicate photos or post too many pictures in a row that are the same. Use engaging posts. Blurry, poor quality photos will not get good engagement. Text based or advertisement type photos are also not appreciated on this social channel. Instagrammers are a bit of a picky bunch. They like photos that are well done, but they also like to engage with users who engage with them. Instagram is more than just posting pictures on your wall and expecting everyone to follow you. Here is some engagement boosting tips which will also help you build your following. 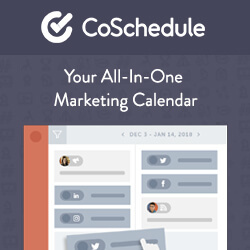 Follow accounts that are relevant to you and your business. Caution: Do not follow more than 25-50 accounts per hour. Instagram does not like bulk follow/unfollow activity. Use Hashtags to boost engagement. You can use an application like Tags for Likes to find hashtags or start collecting appropriate hashtags you see other on other super user feeds. Adding them to the notepad app on your phone is a great way to keep them handy. The most important thing is to “like” other people’s photos and comment when you can. The more you engage with other users, the more likely they are to follow you and engage with you as well. Spend a few minutes each day liking photos in your feed. Do not use automation comment and liking tools this is a recipe for getting your account flagged. Remember you can search hashtags on the search page. Here you can click on the list icon and go through the feed of a particular hashtag, where liking and engaging can bring new users that are not following you to your feed. Everyone had to start at the very beginning. With Instagram unless you are purchasing likes and followers, it is a slow rise to the top. Good quality photos and engaging with others is the best way to increase your exposure using the app. Find some big accounts you admire that relate to your business and learn from what they are doing. Most of all, have fun sharing photos and boosting your businesses brand and social profile. Join our mailing list to receive the latest deals, articles and updates from our team. Copyright © 2011 - 2017 Desktop and Design. All rights reserved.